Pakistan Cricket Board (PCB) Lahore Punjab. • Retired Army officers of the rank of Lieutenant Colonel. • Preference will be given to Intelligence Course qualified officers with field experience. • Candidates must be medically fit in category "A". • The candidates must not be over 55 years of age. • The officers terminated on disciplinary ground are ineligible. Interested candidates fulfilling the above criteria can apply at following address with a passport size recent photograph, latest by 22nd November, 2018. 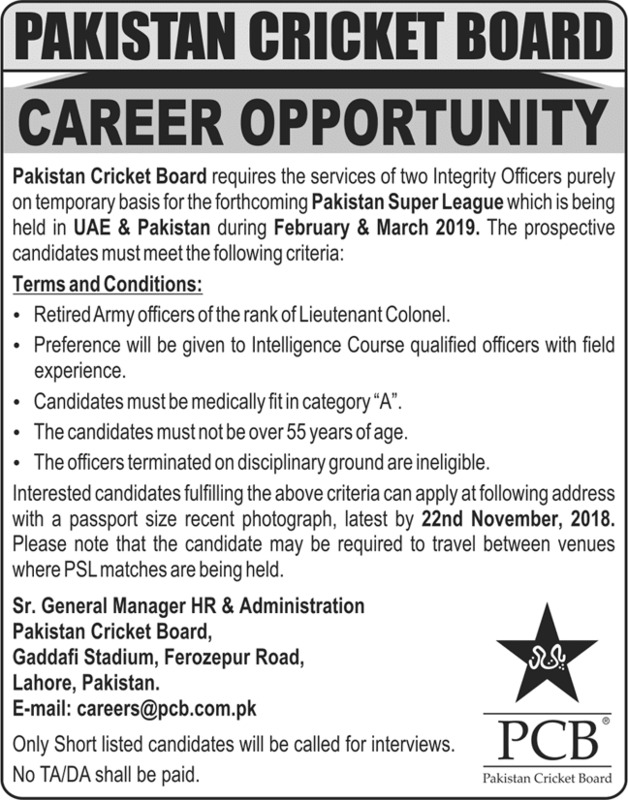 Please note that the candidate may be required to travel between venues where PSL matches are being held. No TA/DA shall be paid. Pakistan Cricket Board. Gaddafi Stadium, Ferozepur Road, Lahore, Pakistan.